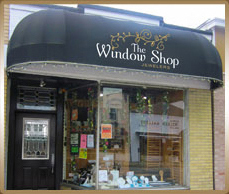 The Window Shop offers convenient services for all of your gift and jewelry needs. Certified Gemologist Appraisals: Rest assured that your jewelry will be appraised by a certified GIA Gemologist. Established in 1931, the Gemological Institute of America is the world’s foremost authority on diamonds, colored stones and pearls and is dedicated to the protection of all purchasers of gemstones. Layaway: We’ll work within your budget to establish a layaway plan. 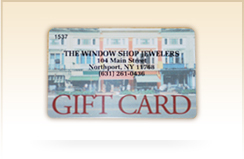 Gift Certificates: The Window Shop offers gift certificates for any amount. Gift Wrapping: Holiday time or any time, we offer beautiful gift wrapping free of charge! Watch Batteries: We carry an extensive line of batteries for watches of all types and brands including Caravel, Bulova and Accutron. Shipping: Available for your convenience at additional charge.